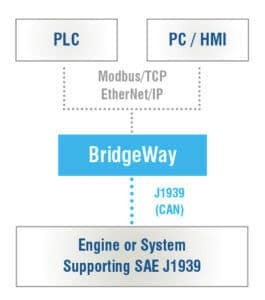 The BridgeWay™ Ethernet to J1939 Gateway (AB7645) supports EtherNet/IP™ and Modbus/TCP protocols over Ethernet. 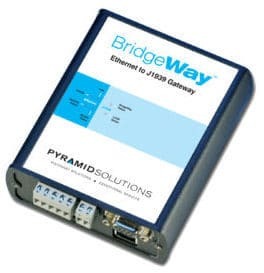 The AB7645 operates as an EtherNet/IP Adapter Class (server) device, allowing an EtherNet/IP Scanner (client) to read and write J1939 network PGN data. The AB7645 also operates as a Modbus/TCP Slave, allowing a Modbus/TCP Master to read and write J1939 network PGN data. 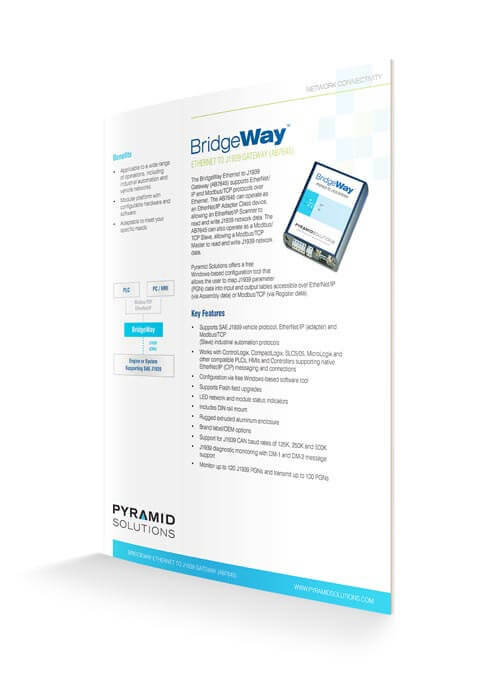 Our free Windows-based configuration tool (BWConfig) allows users to map J1939 parameter (PGN) data into input and output tables accessible over EtherNet/IP (via assembly data) or Modbus/TCP (via register data). It also supports Diagnostic (DM1 and DM2) messages for input messages. Talk with one of our connectivity experts.